The Sinn Féin leader has been condemned for marching behind an "offensive" banner in New York's St Patrick's Day parade. 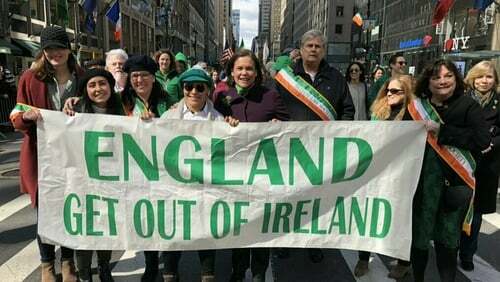 Mary Lou McDonald helped carry a sign that read "England Get Out of Ireland", as she took part in the city's annual parade to mark St Patrick’s Day on Saturday. Tánaiste and Foreign Affairs Minister Simon Coveney accused Ms McDonald of poor leadership and of being an embarrassment over her actions. He tweeted: "@MaryLouMcDonald this is NOT leadership - it's offensive, divisive and an embarrassment - grow up, this is NOT #Ireland in 2019! we are better than this!" Mr Coveney made the remarks after Sinn Féin posted a photograph of their party leader at the parade. The tweet read: "No explanation needed. @MaryLouMcDonald #StPatrickDay Parade #NYC." Ms McDonald was in the United States to take part in the annual St Patrick's festivities. In an earlier post, Mr Coveney commended New Zealand prime minister Jacinda Ardern in the wake of the mass shootings in Christchurch. He wrote: "This is what Leadership looks like - @jacindaardern #NewZealandTerrorAttack". Ulster Unionist Party leader Robin Swann also condemned Ms McDonald's actions. Mr Swann said: "Once again Mary Lou McDonald as president of Sinn Féin, has shown them up for what they are really all about as she posed behind a banner which was highly offensive and wrong on so many levels. "It is clear that when Sinn Féin talk about respect, honesty and integrity, that they are as sincere as Gerry Adams using equality as a Trojan Horse to attack unionists. Their words about rights are only a veneer to hide their true intention. "It is sad that whilst others celebrate St Patrick in a respectful and non-confrontational manner, Sinn Féin return to type." DUP MP Gregory Campbell said Sinn Féin's caption on the tweeted picture, which read "No explanation needed", summed up the party's attitude to explanations, truth and respect. "When slogans such as ‘Brits out’ or ‘England out of Ireland’ are used the unionist community are well within their rights to see themselves as the intended focus," Mr Campbell said. "The 'British presence in Ireland' is the unionist population in Northern Ireland."